To celebrate Street Fighter X Mega Man's one millionth download, Capcom Unity has confirmed that Mega Man 3 will be hitting the North American Nintendo 3DS eShop next week, March 14. Mega Man 4, 5 and 6 will follow each month. Additionally, Unity also let slip some PAX details. An exclusive 25th anniversary pin will be available for showgoers, as well as a the opportunity to participate in a special photo event. "I don't want to spoil it just yet (because uh, it's still being built) but I'm pretty excited about it and can't wait to see the final product," writes community manager Brett Elston. "It'll be at PAX East, E3 and just about every other public show for the foreseeable future." Ooh, mysterious. I wonder what it could be? Wouldn't it be neat if it was, like, a life-size Dr. Light capsule you could stand in? I could totally see that happening. But who knows! I guess we'll find out closer to PAX. OK, so that's Mega Man games through June. What about after that? 6, 7 and X3 for the Virtual Console, maybe? I hope so. So, Mega Man 3 is getting added? Cool, but again, where are the rest of the Game Boy titles? Like I said before, it's been over a year since Dr. Wily's Revenge was added. As much as I like Mega Man 3 and onward, I have mixed feelings about the NES games getting added to the eShop. Even though it's nice to be able to play that and the others on the go, it's completely overshadowing the GB games. The NES games have actually gotten re-releases, those haven't. Pins? PINS?! That's what Brett was so excited about last month? Pathetic. Well, I just can't really get into the merchandise and other media for most game series. I'm in it for, well, the games... so stuff like this just... It's hard to get excited for it, you know? Maybe they'll surprise us at E3, but PAX? It's just a different type of show. 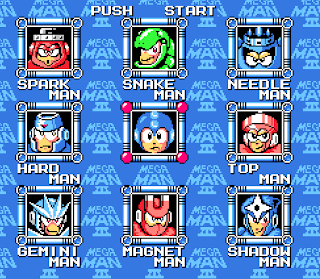 Personally I'm most anticipating Megaman 4, which stands as my favorite of the NES games. Though I'll be getting 3 as well, since it falls in as a close second for me. 5 and 6 will be iffy for me though. 5 had its moments, and some innovative ideas in game design, but just wasn't as well thought out as 4. 6 is pretty generic. This makes me wonder if Capcom will renew publishing the Gameboy games once they've gone through the NES games. MM2GB was kind of a weak entry, so I can see the reason for hesitation. Given long enough I'm hoping to see some more ambitious moves. How about 7? There's no SNES virtual console on the 3DS yet but it can more than handle the demands of SNES emulation. Perhaps just a straight port (maybe with 3D enhancements). Megaman & Bass on the GBA Virtual console seems an obvious choice as well. 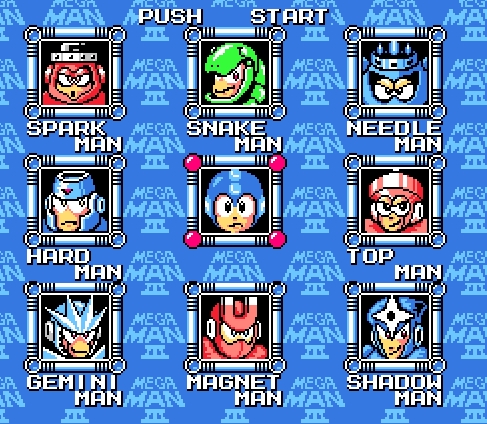 Would Megaman 9 and 10 be too much to ask for? I want to have as much portable Megaman as possible. The least they could do is release MMIV and MMV from the Gameboy onto the eShop. I would probably be the only person to buy Mega Man II and give it a positive rating. It's my favorite of the Game Boy series! I really hope they don't use the GBA version of Mega Man & Bass. The Super Famicom version is way better suited. I already have that game, but would like to play it in portable form. I agree about Mega Man 9 & 10. Still can't wait for 3 to happen, though. It's one of my favorites!